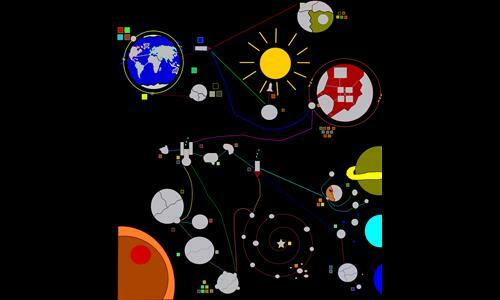 A map of the solar system, with many moons and planets. Lots of fun as a map, but it seemed to have some connections showing that did not connect, like for instance, mining base 2 and the Martian surface, but easily fixed. Review by Nathan on 2/9/2017. This map is all about starting position. In one game with random territory assignments I opened up with 5 armies per turn, in another - over 20. This is a big problem as it creates major imbalance right from the beginning. This could be helped - but not entirely solved, I think - by some distributions. The other issue I see here is that much of the map is very linear. Instead of having a few chokepoints, about half of the map is a chokepoint. Combine this with the imbalance and gameplay is so one-sided as to not be entertaining.